Standing behind one of the solar panels to be installed at the Stratford Ecological Center are, from left to right, Stratford canine Buddy, Consolidated Electric’s Hedi Knouff and Vivian Curry, Stratford founder Louise Warner, Consolidated Electric’s Pam Hawk, and Stratford’s April Hoy and Jeff Dickinson. In front, at the bottom of the solar panel, is a check for $5,000 from Consolidated Electric Cooperative that will be matched by CoBank of Green Village, Colorado. 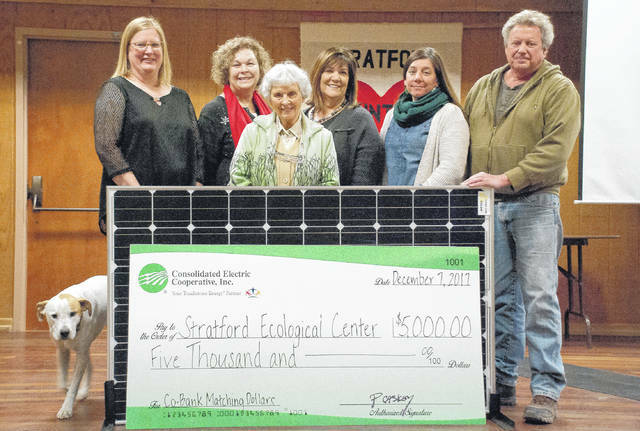 Consolidated Electric Cooperative has donated $5,000 to the Stratford Ecological Center to fund the center’s solar and youth programs. The $5,000 donation was matched by CoBank of Greenwood Village, Colorado. “Altogether you’ll get $10,000 for your programs,” said Pam Hawk, Consolidated Electric Cooperative community relations director. Consolidated Electrical Cooperative is located along State Route 521 in Delaware. Hawk said CoBank is a partner and lender of Consolidated that put together the Sharing Success Program. The bank matches donations up to $5,000 of cooperatives that donate to not-for-profits. According to CoBank’s webpage, it is a cooperative bank serving agricultural businesses across rural America by providing financial services to rural power, water and communications providers. Hawk said Consolidated has donated a total of $25,000 to various organizations with CoBank matching every donation. Hawk said Consolidated’s committee chooses an organization to donate to once a year. Jeff Dickinson, Stratford executive director, said half of the $10,000 donation will go to the center’s solar project. Dickinson said the project is scheduled to start at the end of January and, depending on the weather, could take four to eight weeks to complete. Stratford provides hands-on education in ecological concepts and an appreciation of the natural world. Stratford Education Director April Hoy said $5,000 of the donation will be split between a couple of the center’s local youth programs. The second of the two youth programs is a pen pal program matching a fifth grader from Delaware City Schools with a senior from SourcePoint. Both pen pals read the same book and write to one another about it. Hoy said at the end of the program Stratford will host a pen pal party. Hoy said the teacher who started the pen pal program told her some of the kids and seniors are still pen pals. She said since there aren’t many multi-generational households, kids get a chance to spend some time with an elder person. By bringing generations together, the kids to learn from the seniors, Hoy said. “They have some really neat experiences the kids wouldn’t earn otherwise,” she said. This entry was tagged Consolidated Electric Co-op, Solar Panels, stratford. Bookmark the permalink.